High quality pen that helped promote my business in a big time way. Thank you guys. This is a great company to do business with. They are highly reliable and consistent in their amazing customer service. Our eco-friendly pens came out perfect. My company can't wait to order more in bulk. Thank you Custom Earth Promos. The business was thrilled with the look of the eco friendly pens we ordered from Custom Earth Promos. Being environmentally conscience is always in the fore front for us. We had a very small budget to work with, so combining those two things can be difficult at times. Working with this company allowed us to meet all our needs. It was very fulfilling. Thanks. I quality pen that is recyclable. Justifying an order of 5,000 was made easy purchasing these pens. Our company maintained an earth-friendly mentality at a very affordable price. 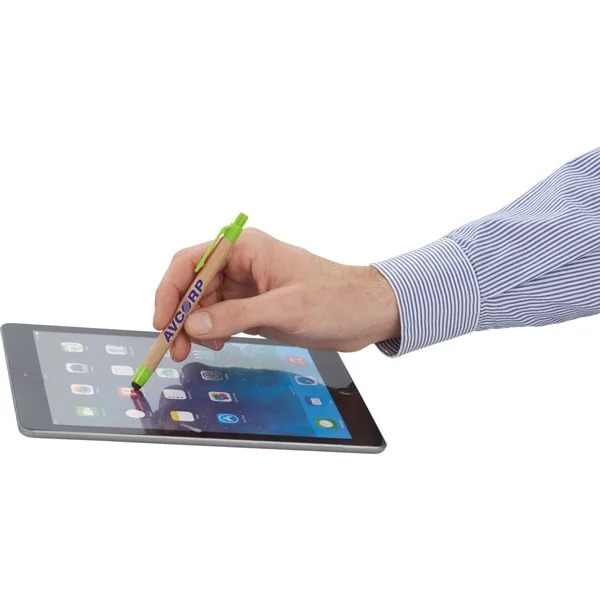 Neat attributes, not only a pen, but a stylus too. I'm all in on these. Our brand imprinted on these eco pens looked flawless. Working with Custom Earth Promos on our marketing project was the easiest process from beginning to end. There is absolutely no competition when dealing with Custom Earth Promos. They provided me with a high quality marketing tool at such a discount. Ordering the eco pens in bulk is affordable and doing our planet a huge service. I highly recommend the EP3. Personalized 3,000 of the eco pens w/ stylus for all our events. The sample we received looked wonderful. We are excited to see how much these help our business and marketing. Our Branded Recycled Pens & Stylus Combo are equipped with a natural paper barrel body and stylish colored trims to choose from. The pen’s recyclable qualities have a positive impact on the environment, as well as a positive recognition for your brand from your future clientele! 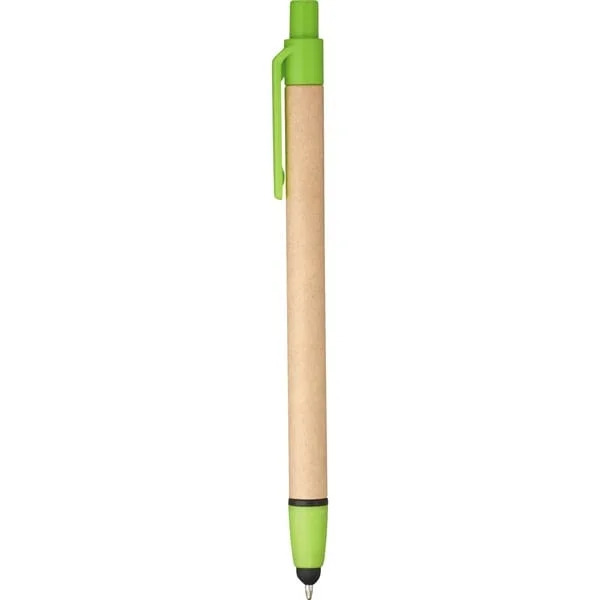 An eco-inspired pen that doubles up as a stylus, will flaunt your brand logo with pride! The imprinting area is well-placed upon the pen’s barrel to boldly advertise your company logo. A natural paper barrel body destined to be recycled offers a neutral backdrop to highlight your brand's imprint design. Equipped with a plunge mechanism that transforms the pen into a stylus when retracted and offered in four trendy colors, your customized pen will be appreciated by all consumers; ultimately suggesting that your business is the convenient resource they need in their lives! Every aspect of our production process abides by our personal goal to create products that are entirely environmentally safe. We perform lead testing programs to ensure the safety standards pertaining to lead are met and in line with the California Proposition 65. We ensure that your promotional product will not only impress your marketing audience with its creative design but will provide an eco-friendly platform to carry out your brand promotion with class. Our eco-inspired pens serve as more than just a successful promotional pathway, they will provide your business with the satisfaction of giving back to your planet. Using these pens as part of your promotional strategy allows you to partake in an eco-friendly movement for audiences to view your business in a responsible light! Prior to finalizing your order, you can place a request for a sample with us. We also offer a digital platform to make it simple to finalize your customized artwork on the promotional eco-pens. Through this digital tool, you can render artwork with your company logo or message on the virtual imprint area of the pen and alter your design to ultimately produce an eye-catching promotional product. Once we receive the finalized artwork blueprint along with the specified quantity and shipping details, we will immediately begin the manufacturing process. Feel free to contact us with any design suggestions or any questions at all; we would love to hear from you!